Submitted by Six Million Steps on 2 June 2007 - 7:58pm. Following the disappointment of their Epic debut, ‘Enjoy Yourself’, which had failed to dent the top 40, the Jackson brothers managed to do something they’d previously been unable to do in the UK, even at the height of their fame as the Jackson Five - reach number 1 on the chart. The Gamble & Huff song, ‘Show You The Way To Go’ would be The Jackson’s only British chart topper, although Michael Jackson would repeat the feat with an old Motown recording, ‘One Day In Your Life’, in 1981, before ‘Billie Jean’ followed suit in 1983, becoming the first of his 6 number 1’s for Epic between ‘83 and ‘97 (Michael would also top the chart with ‘Ebony And Ivory’, the duo with Paul McCartney). The downtempo groove of ‘Show You The Way To Go’ was obviously more suited to British dancefloors as this failed to appear on the US Disco chart, although it reached number 6 on the R&B chart. Evergreen Soul combo, Gladys Knight & The Pips, equalled the number 4 placing of 1975’s ‘The Way We Were - Try To Remember’ with ‘Baby Don’t Change Your Mind’. This, however, would not only be the highest position attained by the group, but Knight’s final appearance in the top 10 until 1989, when she reached number 6 (minus The Pips) with the James Bond song, ‘Licence To Kill’. Garnet Mimms was born in West Virginia in 1933, but brought up in Philadelphia, where he recorded his first record as part of the gospel group the Norfolk Four, in 1953. Following a period in the military, he returned to Philadephia in 1958 and formed a Doo Wop quintet called The Gainors who would record for several labels in the next few years, including Cameo, Mercury and Tally Ho. This group would evolve into Garnet Mimms & The Enchanters, who signed to United Artists in 1963 and scored a big hit with ‘Cry Baby’, whilst consolidating their arrival with ‘Baby Don’t You Weep’ and the Jerry Butler song ‘For Your Precious Love’. Mimms then decided to pursue a solo career, but things didn’t work out as well as he’d hoped for and by 1967 he was sidelined to the United Artists subsidiary label Veep, before experiencing further disappointment after he moved to Verve Records (in-between he spent some time in England, where he appeared on the same bill as Jimi Hendrix at the Saville Theatre, then leased by Beatles manager Brian Epstein). He finally re-emerged in 1977 with ‘What It Is’, a Randy Muller (from Brass Construction) production that reached number 44 in the UK. Prior to this Mimms was probably best known here in Northern Soul circles, where his United Artists single ‘Looking For You’ became something of an anthem a number of years on from its original US release (it was listed as high as number 8 in the Kev Roberts book ‘The Northern Soul Top 500’). The Gap Band first came to my attention via the Stevie Wonder influenced single, ‘Out Of The Blue (Can You Feel It)’ from their self-titled album on Tattoo Records. It would make little impression outside of the specialist scene and it wouldn’t be until the 1980’s that the group embarked on a run of hits, of varying levels of success, starting off with ‘Oops Up Side Your Head’, which reached number 6 in 1980 (and would be accompanied on dancefloors up and down the land by the infamous rowing boat ‘dance’!). Formed in Tulsa, Oklahoma in the early 70’s, by the 3 Wilson brothers (Charles, Ronnie and Robert), the band would be most influenced by the P Funk of Parliament and Funkadelic, which really came out in their music after they’d signed to Mercury in 1979. Their most successful UK single would be ‘Big Fun’, which peaked at number 4 following its 1986 release, although they’ll always be best remembered for ‘Oops Up Side Your Head’ and, in more specialist circles, their 1982 single ‘Outstanding’. Released in the UK on Contempo, ‘Atmosphere Strutt’, written and produced by Patrick Adams, had first appeared in the US on the P&P label. Blues & Soul gave it a 5 star review, which began; ‘Now if you’re looking for plain unadulterated disco corn, Partick Adams is your man! He has a unique way of creating totally commercial riffs that are guaranteed to destroy any disco floor and this catchy stomper has been doing just that for the past four months via imported copies’. Despite going on to tip it for Pop success (perhaps wishful thinking given the B&S / Contempo connection), the track failed to trouble the charts, although nowadays it’s highly regarded by Disco connoisseurs. In 1973 the Detroit Emeralds released one of the classic 70’s Soul grooves, ‘Feel The Need In Me’, which climbed to number 4 in the UK following its release on Janus. There were 2 further British hits in ‘73, this time on Westbound, ‘You Want It You Got It’ (number 12) and ‘I Think Of You’ (number 27), before the group seemed vanish off the radar. By 1977 only one of the Emeralds’ original members, Abrim Timon, remained, but, having secured a deal with Atlantic Records, a new version of ‘Feel The Need In Me’ was recorded, this time with the title shortened to ‘Feel The Need’, and featuring a Tom Moulton mix on the 12â€. It would take them back into the UK chart and the number 12 position, whilst making number 14 on the US Disco chart. However, like many other DJ’s I felt something lacking in this new version, which had lost some of the magic of the sublime original, and I quickly switched back. The Detroit Emeralds were actually from Little Rock, Arkansas (one time home of ex-US president Bill Clinton), but formed in Detroit in 1968 - hence their name. Prior to ‘Feel The Need In Me’, their 1968 R&B hit for Ric-Tic, ‘Show Time’, had been their most successful single. Former Emeralds, James Mitchell and Marvin Willis were soon to return to the chart via the massive hit ‘Float On’ by The Floaters (to be featured in July ‘77 Time Capsule). Next up it’s John Davis & The Monster Orchestra, who went top 5 on the US Disco chart with ‘Up Jumped The Devil’. I remember receiving this as a promo 12â€ with the forgettable ‘Disco Carmen’ by Gramophone Revival on the other side. What was unusual about this was that the Polydor label was on one side whilst it was RSO on the other (‘Up Jumped The Devil’ was issued by Sam in the States). Davis, from Philadelphia, had made his mark in the US with an album of mainly Cole Porter songs in 1976, including the title track, ‘Night And Day’, which, as with ‘Up Jumped The Devil’, reached number 5 on the Disco chart (although it failed to make any impression whatsoever in the UK clubs). As a producer, Davis would work with Phyllis Hyman, Carol Douglas and John Travolta, whilst he arranged for Diana Ross. He played on a number of other artists recordings, with sessions for Grace Jones, The Stylistics, the Salsoul Orchestra and The Trammps, to name a few. His best-known Monster Orchestra track, ‘Ain’t That Enough For You’ would come in 1978, giving the project a minor UK hit. From Dayton, Ohio, Slave was formed by trumpeter Steve Washington in 1975. The members were an amalgamation of 2 bands, The Young Mystics and Black Satin Soul. Ahead of their debut LP, WEA mailed out a promo album of 6 of their current and upcoming tracks, including ‘You And Me’ (alongside inclusions from Boney M, The Trammps, Cerrone and, in contrast to the club based selections, Television and The Eagles). This was almost 2 months ahead of its UK release as the debut single from Slave. Washington would leave the band just 2 years later to form Aurra with fellow Slave members Tom Lockett Jnr and Curt Jones, plus vocalist Starleana Young, who’d joined Slave with Steve Arrington in 1978. Arrington (formerly one of The Young Mystics) would become lead singer and Slave would go on to be regarded as one of the top bands on the black music scene during the early 80’s, with releases including ‘Just A Touch Of Love’ (their only UK hit), ‘Watching You’, ‘Snap Shot’ and ‘Wait For Me’. Arrington himself would leave the band to set up his own group, Steve Arrington’s Hall Of Fame, who enjoyed a big underground track with ‘Way Out’ in 1982. 1983’s ‘Nobody Can Be You’ gained more specialist support, before Arrington dropped the Hall Of Fame to embark on a solo career, making a chart breakthrough in 1985, when ‘Feel So Real’ went top 5 in the UK and ‘Dancing In The Key Of Life’ just missed the top 20. Having experienced a religious conversion in 1986, Arrington began to use his shows as forums for his beliefs during the next few years, before leaving the music scene altogether and becoming a minister at his own Amazing Love Full Gospel Church. Despite the various personnel changes, Slave would continue to record until 1992, although their golden period was undoubtedly 1977-1982. ‘If You Gonna Do It (Put Your Mind To It)’ was the final Peoples Choice single for Philadelphia International, and yet another solid groove. After a 3 year gap they’d eventually re-emerge with releases for Casablanca, then West End, although they’d fail to re-discover the formula that made their Philadelphia singles such club favourites. Another full-on Funk offering, ‘The Pride’, saw the Isley Brothers back at the top of the US R&B chart, whilst reaching number 30 on the Disco chart. The song was one of several socially-conscious political songs the Isleys recorded throughout the 1970s. Philadelphia born keyboardist, songwriter, arranger and producer, Dexter Wansel made his debut with 1976’s ‘Life On Mars’ album, the title track subsequently becoming a Jazz-Funk standard. ‘Disco Lights’ would feature on his follow-up LP, ‘What The World Is Coming To’, taking him into the US Disco chart, where the single peaked at number 25. His love of advanced technology and the fusion of Rock, Soul, Dance and Jazz drew him a small but loyal following, and he’d record 4 albums for Philadelphia International between 1976-79. However, Wansel is arguably more notable for the contribution he quietly made to the Philly Sound in its latter period. Having met Gamble & Huff in the mid-70’s, when he was the leader of a group called Yellow Sunshine, he began working for them as a keyboardist, and later an arranger and producer. His CV includes impressive names like The Jacksons, Teddy Pendergrass, Lou Rawls, Patti Labelle, Phyllis Hyman, and the Philly house band, MFSB, for whom he was conductor for a time. He also co-wrote, with Cynthia Biggs, the 1981 Jones Girls favourite, ‘Nights Over Egypt’ and Patti Labelle’s number 1 R&B hit, ‘If Only You Knew’, from 1984. From West Palm Beach, Florida, Jimmy ‘Bo’ Horne, was one of the main exponents of Miami’s sunshine sound. With Harry Wayne Casey and Richard Finch of KC & The Sunshine Band providing songwriting and production expertise (as they also did for artists including George McCrae and Betty Wright). 1975’s ‘Gimme Some’ had been a US Disco hit for Horne, and ‘Get Happy’ followed suit, reaching number 17 on the Disco chart. His biggest selling single, ‘Dance Across The Floor’ would be released in 1978, but, nowadays, he’s probably best remembered for his 1979 release, ‘Spank’, which, although still produced by Casey & Finch, was written by Ronald L. Smith. Shalamar’s ‘Uptown Festival’ is a record with a fascinating story, on a number of different levels. It starts with Simon Soussan, a legendary, if somewhat infamous, figure on the Northern Soul scene - a French Moroccan who was based in Leeds. With an eye for business, Soussan was allegedly the biggest bootlegger of rare singles during Northern Soul’s golden era in the 70’s. He became a notorious figure as a result of the various ‘scams’ he came up with, and Ian Levine, in an interview with Bill Brewster some years ago, summed him up in the following way; ‘He damaged the scene and people have still not forgotten him after 25 years. He’s still a figure of contempt. But he did discover a lot of great records. He went on to become a successful disco producer’. Re-locating to Los Angeles in the mid-70’s, Soussan had set up a record exporting business in collaboration with Selectadisc in Nottingham. It was here that Ian Dewhirst (DJ Frank on the Northern scene) hooked-up with him. Dewhirst, just out of his teens, had come to the US in order to search for Soul rarities, which he’d send back to his partner in the UK, another important player on the scene, Neil Rushton (who would later play a major role in promoting the Techno movement). Inspired by the success of ‘The Best Disco In Town’ by the Ritchie Family (see Aug ‘76 Time Capsule), Dewhirst suggested that a similar styled Motown medley would work well. Soussan thought a medley of Northern Soul favourites would be better still, but Dewhirst, realising the limitations of this, especially with the US audience in mind, argued that a Motown medley would appeal to a much wider market. Soussan was persuaded that this was the way to go and lost no time in taking the bull by the horns and pulling the project together. This is how ‘Uptown Festival’ was born. Financed by Soussan, his wife, Dewhirst and Rushton, a team of anonymous session musicians were recruited (including El Coco’s W. Michael Lewis and Laurin Rinder and the Los Angeles Philharmonic String Section, amongst many others) and Ike & Tina Turner’s LA studios were hired for the recording. One of the vocalists featured was former Ikette, Pat Powdrill, who remembered her dealings with Soussan being less than satisfactory; ‘He told us this was a demo, for his home use. Simon Soussan took the track to Soul Train Records and made a bank. Patty Powdrill got nothing. Ha ha, isn't that horrible?’. However, before the track was signed by Soul Train, the label set up in 1975 by the famous host of the TV show, Don Cornelius, Soussan had had a meeting with Tom DePierro at Motown’s LA offices, and it was here that he came across an extremely rare single called ‘Do I Love You (Indeed I Do)’ by Frank Wilson, which had been pressed, but never issued, on Motown’s Soul label in 1965. Ian Levine takes up the story; ‘Tom DePierro was quite high up at Motown. He was a very nice gay guy. He had got one of the only two copies that were in existence of this single. According to Frank Wilson, they pressed up some copies and because he was producing Brenda Holloway, and Berry Gordy collared him backstage somewhere and said, ‘Hey man do you really wanna be an artist with all the hassles?’, so Frank says, ‘You’re right Berry I’m not going to be an artist.’ So Berry destroyed the records and, somehow, two survived. Soussan borrowed the copy off DePierro. Every month he would ask for his record back and Soussan would say (mimics Soussan’s French accent) ‘Oh, baby, I bring it tomorrow’, not knowing that he’d sold it to Les McCutcheon (future manager of the band Shakatak). Tom DePierro got AIDS and went to his death-bed without ever getting the record back off Simon. Soussan bootlegged the Frank Wilson as Eddie Foster. He sped it up slightly’. The Frank Wilson (aka Eddie Foster) single would become a Wigan Casino classic and, in 1999, the 2nd copy, which had turned up in Canada in 1990, would change hands for a world record £15,000! The Northern Soul connection also extended directly to Shalamar, who got their name via The Shalimars, whose 1966 Verve single, ‘Stop And Take A Look At Yourself’ had been a Northern favourite. ‘Uptown Festival’ would go on to become a massive US Disco hit, just missing the top spot, whilst reaching number 30 on the UK chart. As a consequence, a permanent line-up of Jody Watley, Howard Hewett and Jeffrey Daniel was brought together, and the hits came thick and fast, all the way through to the mid-80’s. Daniel, previously a Soul Train dancer, is also acknowledged as being the person who brought body-popping to this country, following a British TV appearance by Shalamar in the early 80’s. Ian Dewhirst would return to the UK soon after the recording of ‘Uptown Festival’, where he’d go on to DJ at one of Britain’s pioneering New York style discotheques, The Warehouse in Leeds. Later down the line he’d head up Fourth & Broadway in the UK before going on to devise the brilliant and hugely influential Mastercuts compilation series, amongst many other ongoing contributions to the documentation of dance culture. 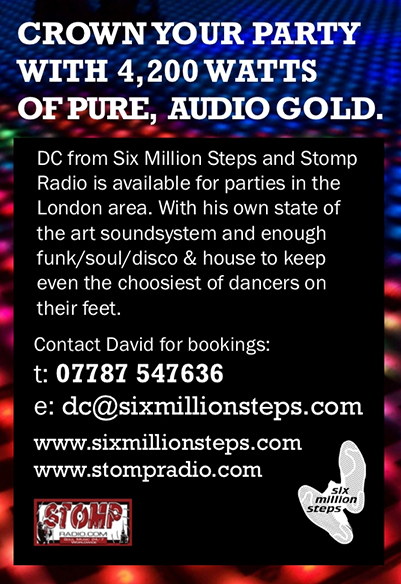 He’s also a member of the Six Million Steps crew and does a weekly radio programme, The Original Mastercuts Show, on Starpoint Radio, with 6MS partner Alan Champ. Simon Soussan went on to produce Disco projects including Arpeggio, Pattie Brooks and French Kiss, often re-writing tracks from the Northern Soul scene to bring them into a Disco context (i.e. - ‘Love And Desire’ by Arpeggio was ‘Stronger Than Her Love’ by The Flirtations). Little has been heard about him since the demise of Disco and his whereabouts are currently unknown. Onto the British artist John Miles, from Jarrow, Tyne & Wear, a vocalist, guitarist and keyboard player who had once been in a band called The Influence with Paul Thompson (later the drummer with Roxy Music) and Vic Malcolm (guitarist with Geordie). Having signed to Decca Records as a solo artist, Miles scored his first hit in 1975 with ‘Highfly’, which reached number 17. His biggest single, the grandiose ‘Music’ went to number 3 in 1976, with his debut album, ‘Rebel’ also going into the top 10. The follow-up single, ‘Remember Yesterday’ didn’t fare quite so well, fizzling out at number 32, but he’d return to the charts one last time, climbing to number 10 with ‘Slow Down’. This was a change of direction from his earlier singles; it was aimed squarely at the dancefloor and became a big club favourite on both sides of the Atlantic (going as high as number 2 on the US Disco chart). Although this was his last hit single, he consistently made it onto the album chart for the next 4 years, albeit the lower regions. During the late 80’s and into the 90’s he worked as musical director to Tina Turner on her various tours and played on several of her albums. To slow things down after ‘Slow Down’, it’s Rose Royce with the 4th single to be taken from the excellent ‘Car Wash’ soundtrack. Gwen Dickey returns to the fore for the mournful ‘I’m Going Down’, a song that was revived in 1994 (the title amended to ‘I’m Goin’ Down’), with Mary J Blige, finally taking it into the UK chart (number 12), the Rose Royce original having failed to show. In mid-May the postman delivered a very welcome package, my first mail out from CBS. This was the final mailing list on my wish list, which meant I was now receiving advanced promotion copies of pretty much all the dance releases issued in the UK. CBS covered a trio of essential labels (CBS, Epic and Philadelphia International) so, along with WEA (Warner Brothers, Atlantic, Elektra, Cotillion etc), it was right up there at the top of the tree. I used to get a huge buzz waking up in the morning to see what the postman had brought. May ‘77 had been my best month to date with regards to the amount of records I’d been mailed - 123 in all! With the exception of the odd import here and there, I was spending next to nothing on new releases, my trips to the record shops being more about digging out copies of older tracks that I didn’t have. Despite the edge that this gave me over other local DJ’s, none of whom were receiving anything like the amount of promos I did, I was unfulfilled when it came to my weekly deejaying schedule. Apart from my nights at the Chelsea Reach, which I always enjoyed, the Penny Farthing was a bit of a chore, whilst The Deerstalker in Birkenhead had failed to take off in the way that I’d hoped. I was badly in need of a change of scenery as I felt I’d been stagnating since the turn of the year. It was time to move on to the next stage, I just needed the break. My prayers were about to be answered.